After the arrival to Canada and soon after my birth, my father began growing a great passion for the sport of Tennis. He loved sports and was an all around athlete himself back in Czech Republic, where he and my mother both played recreational tennis among many other sports. 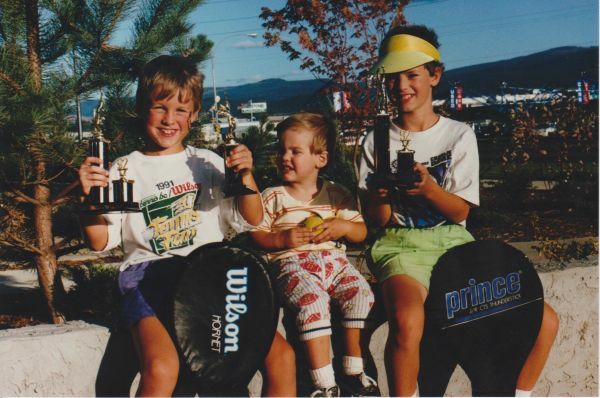 They occasionally played local tournaments and had already begun casually hitting the ball around with their two young sons, but my fathers love of Tennis truly ignited in Canada, and with it, my future career as a tennis player. Growing a slight obsession, he began buying all sorts of tennis magazines and books, started recording tennis matches, and studied the game with great detail and precision. He made "coaching" binders consisting of cutouts of various magazines which he considered as useful coaching tips and guidelines. To this day, I remember exactly what they looked like and much of the material inside. With a newly developed enthusiasm and growing knowledge of the sport, he started his coaching career with my two older brothers. As I grew a little older (around 3 years of age), I would often join the lessons as their personal ball-boy. I would run around, to the best of my abilities as a 3 year old, pick up balls and run them to the basket. I was, of course, not old enough to start playing myself but had already started dragging a mini tennis racquet all over the house. Using this racquet, I would hit any ball that came into sight. Slowly but surely, as I grew older, I started growing increasingly eager to start playing. But, as my dad was busy coaching my brothers, and as I was still too young, I had some waiting to do. During this time, my parents saved enough money for a down payment on a modest two-floor house located across from a high school. My mother, Mila, used the basement of the house for her babysitting work and continued to be a housekeeper for a few houses in the neighborhood. She did this whilst cooking and taking care of me and my brothers, who were getting ready to make the big leap of going to the highschool across the street. My father continued to work draining hours at the brewery. He worked overtime, weekends, and nightshifts. He coached Tom and Petr whenever he wasn't at work or asleep, and continued to learn about the sport. Finally, in 1995, as my brothers were already deep in tournament competitions, I was ready for my first proper lessons.